Laying on her death bed, Paul McGuire (Nicholas Cage) promises his wife, that he will leave his life of organized crime behind to be there for his daughter. That all changes when a decade later his daughter goes missing. The gloves come off and McGuire connects with his old crew and goes after old enemies to find his daughter. This was an entertaining film, but I think it would have been so much better if it were less violent. I love violent action films as much as the next guy, but the story here calls for a more investigative approach, but all McGuire wants to do is beat people for answers. Nicholas Cage stars and is one of those action stars that never goes out of style. He's been going after the bad guys and surviving impossible odds for nearly three decades, becoming very good at it. Despite being an independent film, Rage has a huge cast with many notable names that really help the story along. In fact, with all the named actors in the film, I'm really surprised that Rage wasn't released in theaters. 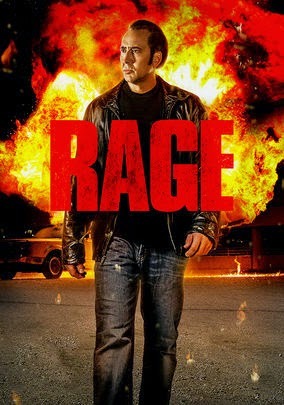 While being entertaining, Rage isn't anything you haven't seen before, as it's your typical who done it, with all the gun fire and explosions you'd expect from an action movie. The cast is experienced and very good, while the plot does have a back story and moves at a reasonable pace. Rage is one of those film where you don't really have to think and ultimately it is somewhat forgettable, but if you're looking for something to watch without having to think too much, than Rage is a perfect choice and it is currently streaming on Netflix.